In perfect harmony with the true local « avalin » style, wood and stone blend beautifully with glass, stainless steel and water to offer a calm and comfortable atmosphere even in the height of the season. Situated on the first floor of the centre, the lounge overlooks the entire Aqua Leisure Complex. It’s the ideal place to relax with a herbal tea or to sample the Water Bar. Play golf in all weathers in Val d’Isère! The Aqua Leisure complex lounge area offers the ideal opportunity to work on your swing whatever the weather on the ultra realistic indoor golf simulator. 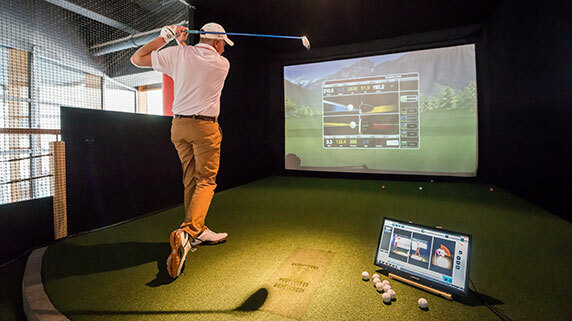 This innovative, high tech equipment, which offers the cutting edge in technology, provides a selection of virtual golf courses with larger than life details and 3D effects. Do you love the thrill of speed and dream of getting behind the wheel of a racing car ? The ELLIP driving simulator is just what you need. Change from F1 to rally with the flick of a switch. Located in the Aqua Leisure Complex Lounge World overlooking the Beach World, expert pilots and ambitious novices are in for a unique experience. Adrenaline rush guaranteed in total safety! 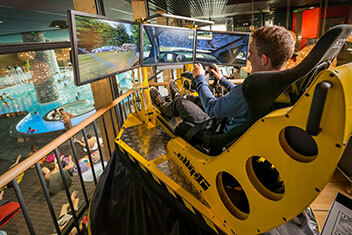 Created using aeronautical technology, this simulator uses technology based on 6 dynamic axes offering authentic sensations of all types of motor racing: F1, rally or GT. It is so precise that many of the top pilots use it for training purposes.